3 in Three was a Macintosh only game put out by Cliff Johnson. The plotline: You are a numeral three in an Excel spreadsheet in a computer (obviously a Macintosh) that gets bumpt off the spreadsheet by accident and are now stuck inside the machine. You have to work your way up from the lowest depths of binary, through the intermediate levels of characters, symbols, math and letters in order to return to the application level and your supposed “right” place in the inner world. You do this by engaging in superlogical trains of thought such as figuring out that “NME” spells “Enemy” and that 7 + 5 = 2. Also highly notable is the degree to which the Macintosh user interface (menu bar) is subordinated to the game, serving regularly as a button rather than a menu. I have no experience with the music or sound effects, but they really aren’t needed to justify my explanation of the game as being amazzing and completely worth the effort of getting System 7 running in BasiliskII or other emulator in order to play the game. I am eagerly awaiting the successor “3” games that he claims to be making. Note that his latest game was about 10 years in production, so don’t write it off as vaporware. This entry was posted in gaming, Macintosh, retro, review and tagged 3 in Three, Cliff Johnson on February 24, 2015 by FlowCoef. Here is a matchbox sized box of staples from who knows when. I’m guessing the 50s? This entry was posted in ephemera, retro and tagged artifact on January 26, 2015 by FlowCoef. No, not made out of cardboard! A “Night Owl”. I have no idea where this was first published. If someone will let me know, I will edit this post and include the attribution. This entry was posted in ephemera, retro and tagged artifact, craft on January 25, 2015 by FlowCoef. Further digging turned up this slightly more complete piece of educational past. This entry was posted in funky, publishing, retro and tagged inexobs, textbook trash on January 22, 2015 by FlowCoef. Shifty Sam Hinks the banker, inviting systemic disaster. I found this in an old LIFE magazine from August 20, 1971. The pages were larger than A4, so I could only partially scan it. Aside from the odd name of the firm, though logical given its long history to then, what a shifty pair of loan “men”! The one on the right looks like a 1920s used car dealer with his noxious necktie and stand up collar and probable cellophane flower in his lapel. His expression is peculiarly malevolent, like he knows you’re going to default on it but can’t stop yourself signing it. His nose appears to have been punched by a desperate debtor at least once. Probably in his early days before he could spot a “mark” as well as he does now. 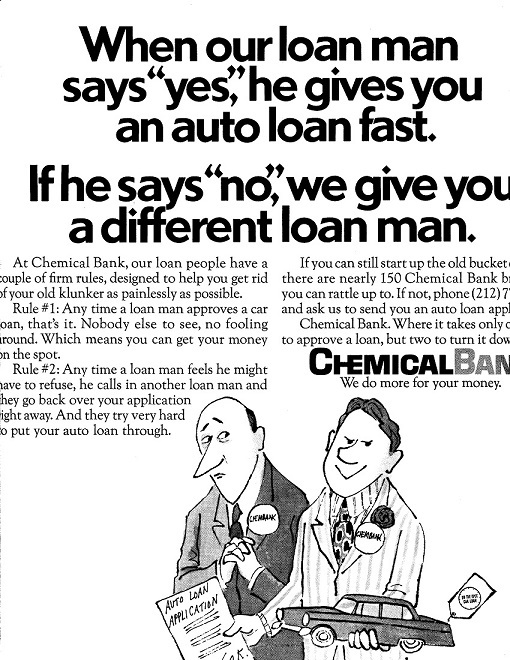 This entry was posted in advertising, ephemera, funky, retro and tagged artifact, Chemical Bank on January 18, 2015 by FlowCoef. 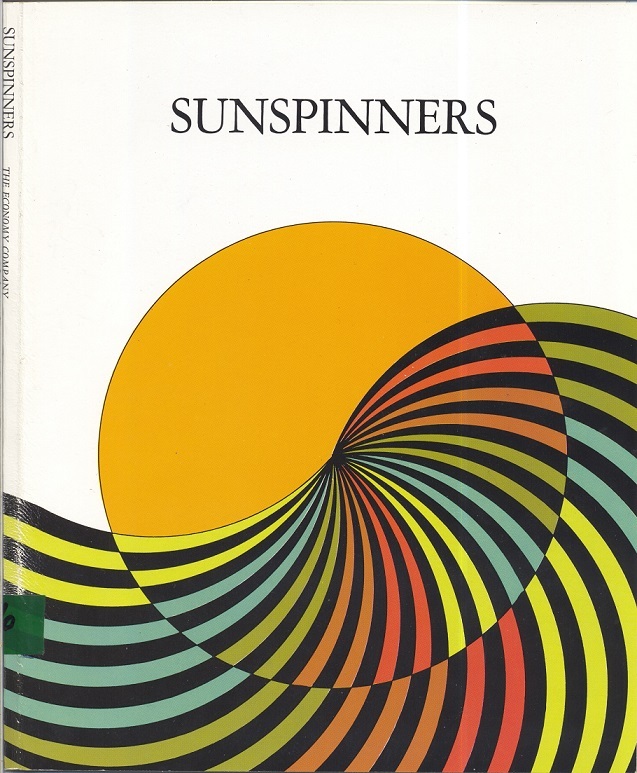 Other than being published by Allyn and Bacon with a copyright of 1978, I cannot find anything on this online. Was it about learning to tell time? Time management? Time itself? New Math? Time may tell, if anyone has the time to find out and put it online, or takes the time to comment. I will not make any more “time” jokes, since the indisputed king of them is Cliff Johnson of “3 in Three” fame. I will ask: Why is there a hole in the center of the clock face, where the stems of the hands would go? Why is the stem of the pocketwatch off centered? Shouldn’t it be divided in half? For that matter, shouldn’t the number 12 at the top? 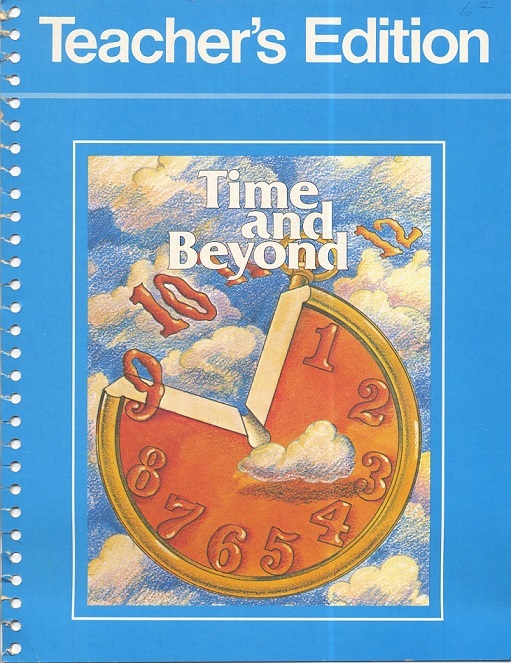 I would like to know – seriously – what the “beyond” referenced by the title is. This entry was posted in education, funky, retro, textbook and tagged inexobs, textbook trash on January 17, 2015 by FlowCoef. How to troll your students! Are you a grade-school teacher? Want to troll your students? This entry was posted in education, funky, retro and tagged artifact, inexobs on January 17, 2015 by FlowCoef.